Convey your heartfelt wishes by gifting this Spectacular Combo of Delicacies to the people dearest to you. 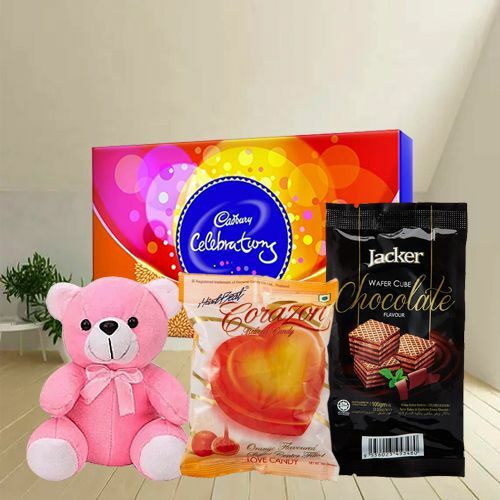 This exclusive Gift containing a Small Cadbury Celebration Pack, a Jacker Waffer Packet, a Corazon Chocolates Packet and a Small Teddy, is meant to be presented to someone very special. Flowers Delivery Taran Taran, Send sweets Shimla, Wedding Cake Bijapur, Diwali Mithai Kozhikode, Send Flowers and Gifts to Anand, Online Shop Panaji, Flower to Proddutur, New Year Flowers Ongole , Fresh Fruits Mhow, Send Gift Jalandhar, Dry Fruits to Aligarh, Birthday Delivery Hyderabad, Sending to Raipur, Flower shop Hosur, Meerut Online Cake Delivery.